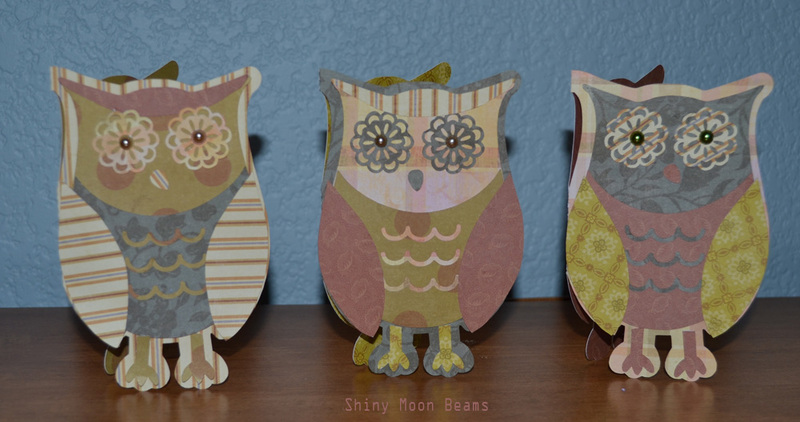 I made 3 cute owl cards with my silhouette cameo. It's great to have this wonderful cutting machine because I can now offer my customers hand crafted cards that are just adorable. The other day I made the most adorable 3-D art butterflies and some adorable butterfly cards. I was cutting away on the silhouette cameo for a few hours and then a bit longer to make the cards. I love this craft so much. I do miss doing my quilling, I need to get back and finish making my birds, I made two quilled bird and I have two more to make. I need to make my cookies with the bird cookie cutters I got recently also from Ann Clark. But I think today I am going to make some mini pineapple upside down cakes to go with our Sunday Dinner. On Sunday I like to have dessert. Last night while watching TV I began crocheting some 4-Leaf Clovers. I might try to felt them when I am done, we will see. I have crocheted four flower brooch pins recently, I really love them. You can find them here and here. 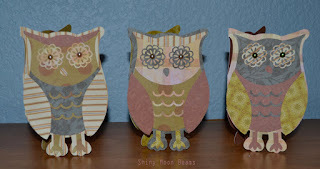 I made a cute little owl ornament, you can see that here. Read about my crochet thread fiasco here. Grr to that thread fiasco, I am still upset over that. Very cute owls. Nice job. Your owls are really beautiful!! !